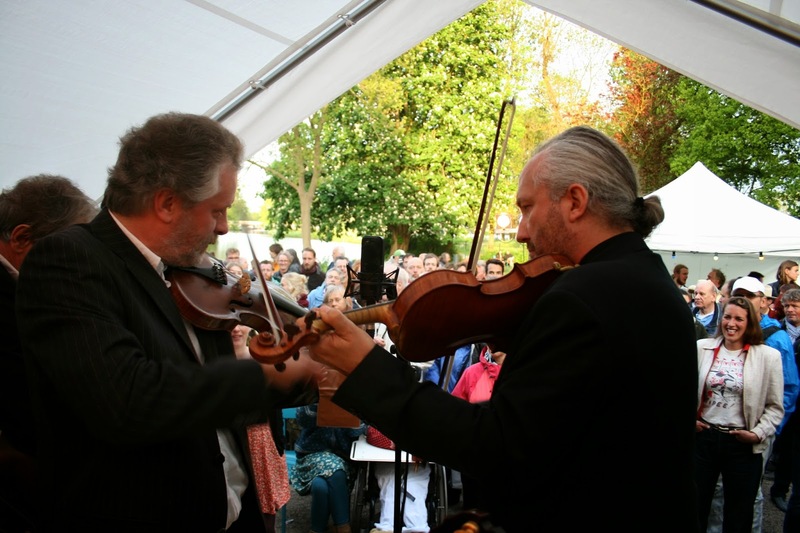 Yesterday (May 14, 2015) was the 3rd annual festival held on the grounds of De Parel van Zuilen, located outside the city limits of Utrecht, Netherlands. Gulpener Bluegrass Festival host Joost van Es -- with the host band, Four Wheel Drive -- had a great day for music with some sunny springtime weather. The crowd that gathered by the small river which ran just behind the two outdoor stages were taking full advantage of the sun, grassy lawn, and the very large fresh-made hamburgers onsite! 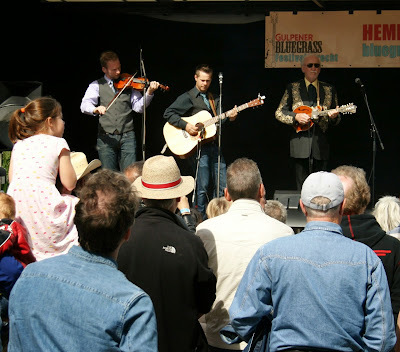 The audience seemed to be a nice balance of new faces and veteren bluegrass fans. Many were there to simply spend a day outdoors with music. Some were locals unaware of bluegrass music but there to support the venue and event, while others were taking the rare opportunity to see one of the most accomplished bluegrass artists in the business, Doyle Lawson. Having spoken with several bluegrass musicians in the crowd throughout the day, I was surprised that some of them did not know anything about Doyle Lawson or his music. Lawson's band performed 2 shows...and it seems everyone stayed for both sets. I also noticed that two of the people I spoke to early in the day, whom were seeing and hearing the band for the first time, were standing on chairs and benches taking-in the awesome vocal harmonies that filled the air during his final set. Authors of the newly released publication about the Dutch bluegrass scene "High Lonesome Below Sea Level: Faces and Stories of Bluegrass Music in The Netherlands" Loes van Schaijk and Marieke Odekerken took center stage to present Doyle Lawson with the first hardcover book off the press. Now officially released and available, you can see the details at bluegrassportraits.nl . All in all it was a full day of music with nine bands of various acoustic music styles alternating between two stages, plenty of sun, the sponsor's beer, giant (100% real beef) hamburgers, plus a few hundred people hanging out and surely looking forward to returning next year. 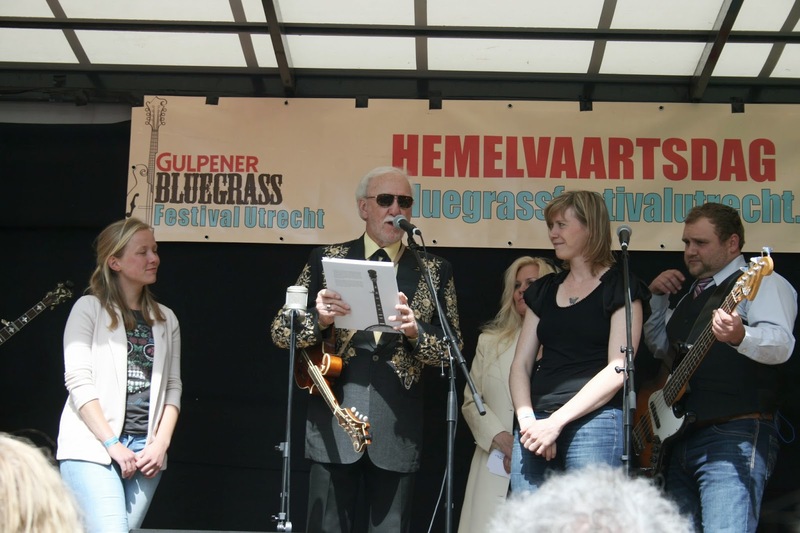 Check out theses web sites where you can find details about the annual festival in Utrecht: bluegrassfestivalutrecht.nl and the De Parel Sessies music series: deparelvanzuilen.nl.